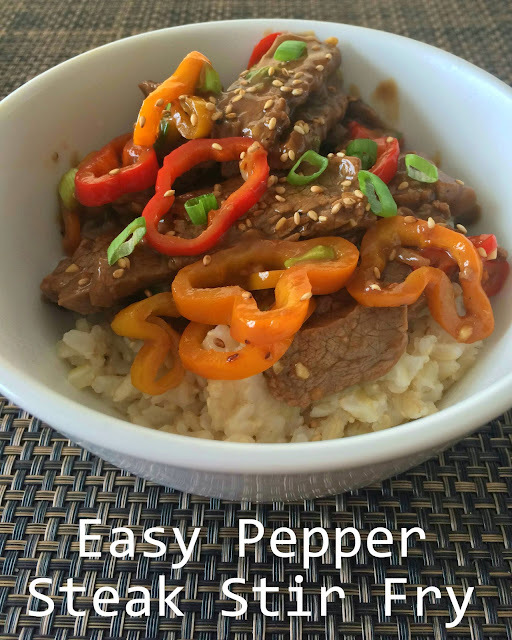 I found this recipe for a simple sounding Asian pepper steak stir fry and decided to surprise him. He loved it! So, based on his opinion, this recipe is a keeper. I just love all the colors in this. You could easily sub out the steak with chicken, shrimp, or tofu. If you do, let me know how it is! I'll have to try it sometime. Add all marinade ingredients to a gallon sized bag or a large bowl. Stir to combine, then add sliced steak. Make sure all steak is covered in the marinade and refrigerate. I let it sit for about an hour. Heat 1 Tbsp oil in a large skillet over medium-high. Add the sliced peppers, white part of the onions, ginger and garlic and saute for about 3 minutes. Stir occasionally to prevent burning. Remove veggies and set aside. Add half the steak with a spoon with holes to conserve the marinade and saute for 2-3 minutes until browned. Toss steak to ensure both sides cook. Remove and set aside with veggies. Repeat with the remaining steak. Add reserved marinade to the pan and saute until thickened for about 1 minute. Add all veggies, steak, and the green part of the onions and stir to combine for an additional minute. Remove from heat. Serve over rice or quinoa or eat a side of veggies. I sprinkled sesame seeds for looks.